You Deserve the Best! Stay in the Beautiful Penthouse-$100 off any August week ! Best unit in Baywatch! Direct Oceanfront unit! Brand new living room furniture for 2018, brand new bedding, brand new air conditioning and heating unit, new washer and dryer, new pots and pans, and freshly painted! 2 new queen beds added in master bedroom which means 4 queen beds in the unit total now! 2 queen beds in each bedroom. 3 HDTV's with lots of channels, FREE Netflix along with free local and long distance calls, luxurious furniture, queen beds, wireless internet access and much more! All this while still staying at one of North Myrtle Beach's best full service AAA 3-diamond resort, the Bay Watch Resort & Conference Center. The huge 600 foot oceanfront pool deck is sure to impress! With an oceanfront pool, whirlpool, lazy river, and kiddie pool, there is no better place to relax & play! Cool down at Flip Flops, the oceanfront pool bar & grill, featuring specialty frozen drinks and serving your favorites from the grill. Our condo has a private oceanfront balcony! Fully stocked kitchen just like home, dishwasher, washer & dryer in unit, 3 TVs and 3 DVD players. The unit sleeps up to 8 people/6 adults max! There are 2 private bedrooms and 2 baths! The Master bedroom has a private bath and sliding glass doors that open to the view of the ocean. Amenities: Baywatch's water amenities are unmatched in Myrtle Beach and are as follows: Two (2) Indoor pools, two (2) outdoor pools, one (1) indoor lazy river, one (1) huge outdoor lazy river, three (3) indoor hot tubs, four (4) outdoor hot tubs, and indoor and outdoor Kiddie pools. Plus a brand new outside pool deck bar with live entertainment. Outside Shower, Two Restaurants on premises, Sports bar, Outside Cabana bar during the summer, Exercise and game room. Because I want to keep a high quality and standard for the Penthouse accommodations I will be limiting the number of guests that will stay in this unit again this year. That way it will always be extremely clean and the furnishings of a very high standard. So if you want the best and are tired of being disappointed pay a little more for the Penthouse. Please book early as I always fill up very fast! Freshly made beds and towels with all reservations: You get all linens and towels with each reservation. Plus new queen beds in the master bedroom and now two newer queen beds in the other bedroom as well. I now have 3 HDTVs one in each room. You will have trouble beating my prices when you add in linens and all the amenities you get in my unit. Plus I keep my unit in top shape and very clean! So come see why so many people come back and stay with me each year. I have a internet phone but I would encourage bringing your cell phones as your main way of communicating. So far the phone has worked great and the best thing is its free for all guests to call anywhere in the US. I take great pride in making sure my guests arrive to a clean unit with freshly made beds and a fully stock kitchen for cooking if you feel the need to make a family meal during your trip. With easy check-in instructions you also get my cell phone which I answer 24/7 to handle any issues that may arise. Because its the Penthouse and has everything you need to make a great vacation and memories for your family trip to Myrtle Beach. Just check out the reviews! Brand new living room furniture for 2018, brand new bedding, brand new air conditioning and heating unit, new pots and pans, and freshly painted! 2 new queen beds added in master bedroom in 2017 which means 4 queen beds in the unit total now! 2 queen beds in each bedroom. The view is awesome plus no noisy neighbors above unless you count the Seagulls! I keep the place in top shape and very clean! Each bedroom has a bathroom in case you bring two separate families. Best view in all the resort from the Penthouse! To many golf courses to mention in the local area. Any smoking in the unit will be a loss of the full $150 damage deposit due to allergies of family member! Plus any smoking in the resort area can be cause for a $200 fine. We had the pleasure of staying in this condo for Spring Break and it was wonderful! The pictures of this condo do not do it justice. It is beautifully decorated and sets the perfect setting for a beach vacation. The kitchen has everything you need and there were plenty of towels available. The owners are very responsive and very accommodating. The location of the building is in a great area for families. We would love to stay here again!! John S.Where do you live? Great place! Easy to deal with! We loved our vacation and the condo we stayed in was spectacular! Top floor view of the ocean was amazing! The set up is perfect for families with teenagers because they have a little bit of their own space. Very clean and well kept. Brian was awesome responding with questions right away! I would definitely recommend this to anyone needing a home away from home vacation. Would definitely go back! I am glad you had a awesome stay and hope you stay again in the future. We try and make our condo as nice as possible for our guests. Thanks for the great review! We had nice, long stay in the winter months, and we enjoyed this unit very much. The owners have made our stay as comfortable as possible. We especially appreciated the keyless entry, the fabulous view, the extremely comfortable beds, and the luxurious bedding. The kitchen is well stocked, including some staples that you don't usually find in a rental unit. The owner is very quick to respond to any issues, and remedies them quickly. Thank you for such a nice winter get-away! I and my husband were very pleased with condo! Very clean! Beds were super comfy! Beautiful view! Couldn’t of asked for more! Thank you Brian! Thank for the kind words and I am glad you enjoyed your stay. It guests like you that make renting my place a pleasurable experience. Hope to see you again next year. Baywatch Resort is located in quiet North Myrtle Beach at the very end of South Ocean Blvd. South Ocean Blvd dead ends right at Baywatch so there is none of that annoying beach traffic when you walk around the resort at night or go to the garage to get your car The resort is just minutes from Restaurants, shopping, movie theaters and Barefoot Landing. 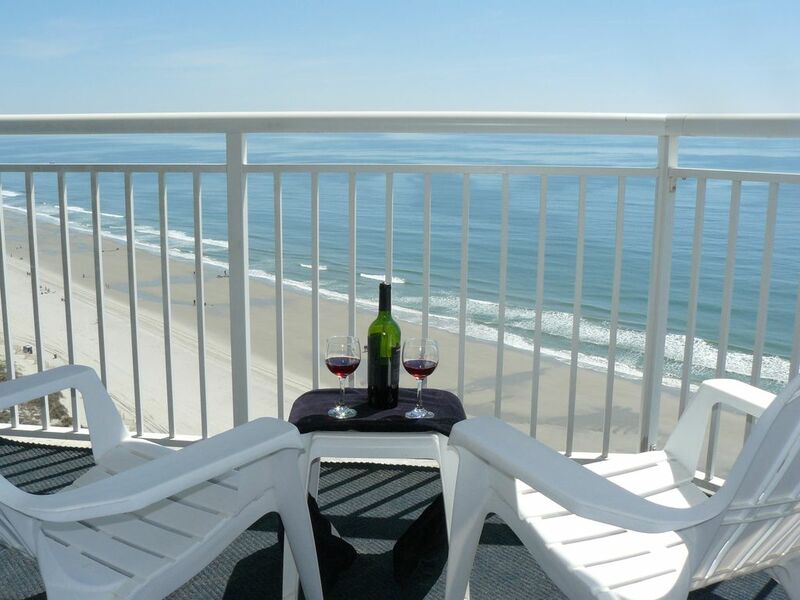 Located right on the Ocean the resort is one of the most sought after locations to stay in North Myrtle Beach. Also try and find a bigger pool deck anywhere in MB along with a oceanfront outdoor pool and beach bar with nightly entertainment during the summer. Rates are subject to change until confirmed by owner. The property is not reserved until a deposit and/or payment has been made. Once deposit is made the deposit is non- refundable and becomes a cancellation fee if you have to cancel before making final payment. If you need to cancel after making final payment the entire amount is non-refundable unless the unit can be re-rented for the same amount. If it can you will be refunded the rental amount minus the deposit which will still be a cancellation fee. If the unit is rented for less you will be refunded that amount.